People Soup by Ross McIntosh: Personal Resilience & Peak Performance with ACT! Personal Resilience & Peak Performance with ACT! I use Acceptance & Commitment Therapy (ACT) in my work with organisations and individuals. I can honestly say that ACT has changed my own life and that is one of the reasons why I am passionate about sharing this behavioural science. This post is a brief introduction to the psychological skills training I have developed with Dr Paul Flaxman at City, University of London. I'm currently delivering this skills training to teachers, the NHS, Civil Servants, private sector organisations and ballet companies. We have adapted ACT to make it relevant and useful for the workplace. The evidence for training based upon ACT in the workplace is strong and will be the subject of a future blog post. We present the framework for the training using this illustration. In the training our aim is to practice and develop three key skills (represented by the pillars) over a series of workshops. AWARE - We know that the mind's favourite place to hang out is ruminating about the past or fretting and planning about the future. This is the central pillar of our training and relates to the skill of being in contact with the here and now. This skill is a form of mental training where we can begin to recognise times in life when we are on autopilot and learn to change gear to shift us into noticing the present moment. The skill we're developing enables us to be more effective at gathering the 'scattered mind'. Let's be clear - I'm not knocking autopilot, some consider it to be the greatest evolutionary advance of the human mind, but sometimes in our lives we're on autopilot when it's not so useful. ACTIVE - We talk about values as being the personal qualities we most want to express in our daily behaviour. 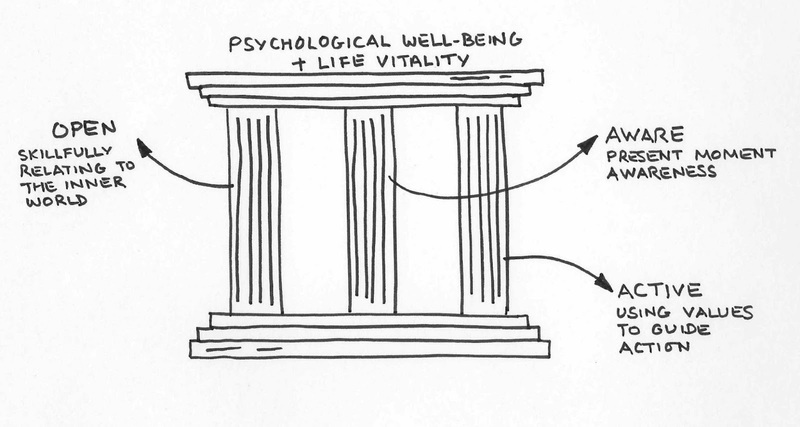 This ACTIVE pillar is all about 'who we want to be' or 'what we want to stand for'. We may have some personal values that are a rich seam throughout our whole lives, others may become more prominent in different phases of our lives and some may be very useful for specific life events. We may also have different values that are important in different areas of of life. For example, if I'm presenting to the Executive Board I'll pause before the meeting to connect with who I want to be during my part of the meeting and this then serves as a beacon for my behaviour. That's what values are all about for us - using them as a guide for our actions and behaviour. OPEN - As humans we know that we can often get hooked or hijacked by our own inner experience and this is the theme of the third pillar, OPEN. By our inner experience I mean our thoughts, emotions, urges, memories and sensations. We are particularly interested in the 'chatter' of our inner experience and how this can interfere with us being who we want to be in different areas of our lives. The skill we focus on here in our training is to identify this inner chatter and notice the impact on our behaviour. Our aim is to change our relationship with this chatter to lessen its impact in our lives and on our behaviour. 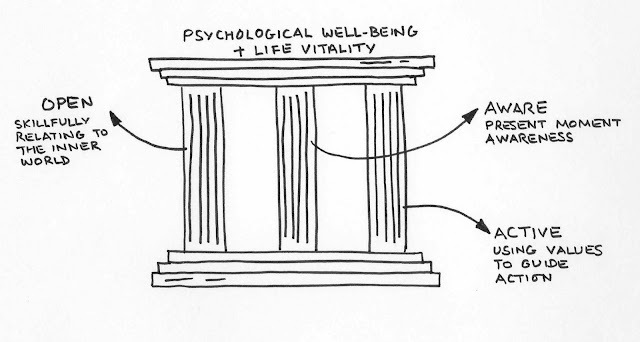 Through building these skills we support the development of psychological well-being and life vitality across every area of life. We aim to enable the awareness of the present moment, an exploration of what matters and noticing what happens inside of us that makes it difficult to move towards what matters. We typically deliver this training to small groups over four or five sessions to allow people to practice the skills and share their experiences. We are collecting both qualitative and quantitative data which we will be analysing over the coming months.